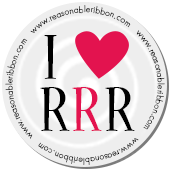 For the June RRR Blog Hop, click HERE or scroll down. Hi there crafty peeps! I am popping in today to share a card I made for my mom's upcoming birthday using the Vintage Flowers stamp set from Altenew and ribbon from Really Reasonable Ribbon. I stamped some of the flower images with the new Altenew Crisp Color die inks and filled in some of the color gaps with other inks from my stash. This set is an "image builder set" so several images are stamped on top of each other with different shades of ink to create the final image. I fussy cut out the two main flowers from white cardstock and popped them up with foam dots. I covered all of the blooms with Clear Wink of Stella. The patterned paper is from Lawn Fawn. The sentiment is from an Old Simon Says Stamp set. I added some sparkle enamel dots from Doodlebug as an accent. My sash and bow were made with Sheer with Four Satin Stripes Ribbon White ribbon and the Bow-It-All tool. I hope you enjoy and have a wonderful day! a beautiful bow with a beautiful flowers make a beautiful vintage creation.